the browser long enough for [our] timeout to trigger and kill it. Originally, the Firefox plugin crash protection was set at 10 seconds. After a plugin has not responded for 10 seconds, the browser would kill the plugin and allow you to reload the page or restart the plugin. Unfortunately, these problematic web apps are taking longer than 10 seconds to load and the crash protection was kicking in before the plugin would respond. Firefox 3.6.6 has bumped the crash protection setting up to a 45 second time out and it has reportedly resolved the issues with Hulu and Farmville. Other apps may still be seeing issues if they take longer than 45 seconds to load at some points. You can control the crash protection time out of your locally installed Firefox through the About:config. Open a new tab and type about:config in the address bar and hit enter. 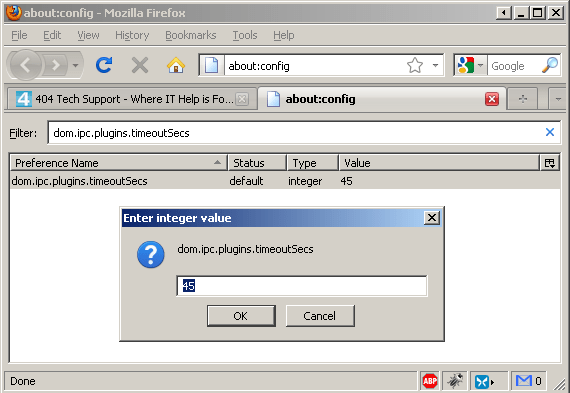 In the filter box, type dom.ipc.plugins.timeoutSecs. When the Preference is found, you can double-click on it to adjust how many seconds the crash protection waits before kicking in. You can also set it to -1 in order to disable the new plugin crash protection. This also introduces a new process that runs alongside Firefox now, whether you have Crash Protection disabled or not, called plugin-container.exe that takes up about 30 MB of memory from what I’m seeing. In other news: Productivity around the world sky-rocketed for 4 days and then plummeted again to standard sub-par levels.